I was running BitDefender at the same time and uninstalling it fixed these issues. 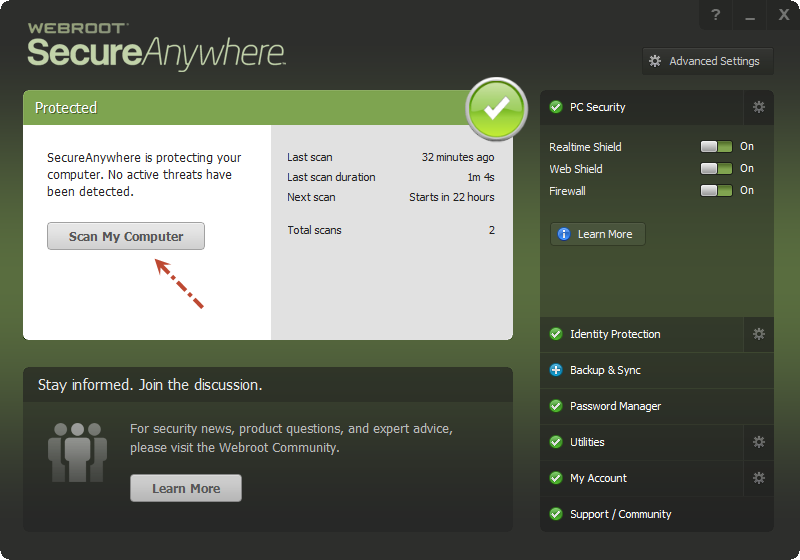 I just started using Webroot on two of my PCs and I started to see strange things right away, most of them attributed to the Identity Protection aspect, and I'm afraid this is going to continue further. The sign of a good antivirus program is to not realize it's there, and I understand how difficult this can be, but I also know it's possible by working with popular programs to stabalize features, and I would say Chrome and Firefox fall into those categories. Chrome would not connect to any pages until ID Protection was set to "allow". I was able to replicate these issues on two computers running Windows 8.1 x64. Has anyone else experienced weird issues with ID protection? I look forward to seeing this feature improved because I can assume that it is most useful when used with a browser, but, as it stands, it doesn't work properly. I was searching and there seems to be a conflict with Bitdefender and WSA together so that could be your issue as well? http://www.wilderssecurity.com/showthread.php?t=353920&highlight=Bitdefender notice post 12!! I can not confirm this but I am only running Win7; however, I do find this "allow" anywhere in Webroot settings or on the extensions. Can you post a screen shot and steps to get to this setting? Thanks. Here's a quick tutorial of how to get to these settings. Click the GEAR next to Identity Protection. Can you Right Click on the Webroot Tray Icon and Save a Scan Log and look for the Chrome files and can you tell me if any files have a [u] if front of them? Also go here when Chrome is running and see if it's being Monitored: http://www.webroot.com/En_US/SecureAnywhere/PC/WSA_PC_Help.htm#C10_SystemControl/CH10b_ControllingProcesses.html and please report back. Also why are you downloading in Private mode in Firefox? Also I just tried in Firefox in Private mode and downloading and opening another tab to see the Community and I had no issues with the download. It would happen every time I would open a tab and go to a new webpage. As soon as I tried to load a new webpage (any web page, even google.com) it would stop the download. Chrome.exe was in the active list and it was set to "allow"
When I don't want cookies or browser history to be stored, I switch to private mode, like if I want to browse amazon without linking a bunch of weird items to my account, it's a pain to individually remove those from my history, but there are plenty of uses for private browsing among the obvious ones. edit: Additional note - I'm also running BitDefender on this PC, and I'm wondering if I should just uninstall that if there are known conflicts. First thing I see is WSA is not communicating with the Cloud correctly because you have allot of [x] files so I would suggest that you Submit a Support Ticket ASAP so that they can look into it further also do you have any other security software that could be blocking WSA to the Internet? I made al ast minute edit to my previous post. I'm also running BitDefender. Could that be causing the problem? I've had it on my PC for so long I forgot about it. And I see Bitdefender's files but it has an [x] in front of them. I'm running the Free addition and it's bare-bones. It doesn't even have any information within the logs about specifics. It's just Virus Shield toggle on/off and Auto Scan toggle on/off. That's all. Closing bitdefender didn't help. When Chrome is set to "Protect" for ID Protection, no webpages connect. Well there is something Blocking WSA from fully communicating to the Cloud if you look at your Scan Log you have mostly [x] files which means it's not communicating with the cloud properly so Contact support Please. Or Uninstall Bitdefender & WSA and reboot and Install WSA to see if it working fine and make sure you have a copy of your keycode before doing so. Then look at another Scan log to make sure you have no [x] files. Thanks for the help Danial. I sent in a support ticket. Are you doing the Default Deep Scans or Full scans? If they are default scans the Scans times are much longer than it should be also many more files are being looked at which is an indication of conflict maybe with Bitdefender Free. Can you uninstall both and reboot and install WSA by itself for a test? It could be that Bitdefender's realtime shield is scanning every file that WSA scans. As my system scans in about 35 to 45 seconds. I've also been having trouble with my hard drives taking 10-15 seconds before explorer pops up on certain USB3.0 externals (brand new). When I go home I'll try this and post and update. Thanks. Note: I'm using an Intel i7 CPU with SSD's but for most it should be under 2 minutes for scan times unless your using an old system. How are your Scan times now? You are doing a default Deep Scan? That's still to high! Can you please do a clean reinstall of WSA? Make sure you have a copy of your keycode and Download a new Installer here then Uninstall and REBOOT and then install with the new installer and after the install scan REBOOT again and do a default Deep scan and posts the details as above! That was my work PC after the uninstallation of BitDefender + a restart. I had to leave work and when I got home I uninstalled both, restarted, and I reinstalled Webroot. Much better!. Next time I go to work I repeat the process. Thanks again! Great to hear and stick around we are a great bunch here!